The history of geography includes various histories of geography which have differed over time and between different cultural and political groups. In more recent developments, geography has become a distinct academic discipline. 'Geography' derives from the Greek γεωγραφία – geographia, a literal translation of which would be "to describe or write about the Earth". The first person to use the word "geography" was Eratosthenes (276–194 BC). However, there is evidence for recognizable practices of geography, such as cartography (or map-making) prior to the use of the term geography. The oldest known world maps date back to ancient Babylon from the 9th century BC. The best known Babylonian world map, however, is the Imago Mundi of 600 BC. The map as reconstructed by Eckhard Unger shows Babylon on the Euphrates, surrounded by a circular landmass showing Assyria, Urartu and several cities, in turn surrounded by a "bitter river" (Oceanus), with seven islands arranged around it so as to form a seven-pointed star. The accompanying text mentions seven outer regions beyond the encircling ocean. The descriptions of five of them have survived. In contrast to the Imago Mundi, an earlier Babylonian world map dating back to the 9th century BC depicted Babylon as being further north from the center of the world, though it is not certain what that center was supposed to represent. The ancient Greeks saw the poet Homer as the founder of geography. His works the Iliad and the Odyssey are works of literature, but both contain a great deal of geographical information. Homer describes a circular world ringed by a single massive ocean. The works show that the Greeks by the 8th century BC had considerable knowledge of the geography of the eastern Mediterranean. The poems contain a large number of place names and descriptions, but for many of these it is uncertain what real location, if any, is actually being referred to. Thales of Miletus is one of the first known philosophers known to have wondered about the shape of the world. He proposed that the world was based on water, and that all things grew out of it. He also laid down many of the astronomical and mathematical rules that would allow geography to be studied scientifically. His successor Anaximander is the first person known to have attempted to create a scale map of the known world and to have introduced the gnomon to Ancient Greece. Hecataeus of Miletus initiated a different form of geography, avoiding the mathematical calculations of Thales and Anaximander he learnt about the world by gathering previous works and speaking to the sailors who came through the busy port of Miletus. From these accounts he wrote a detailed prose account of what was known of the world. A similar work, and one that mostly survives today, is Herodotus' Histories. While primarily a work of history, the book contains a wealth of geographic descriptions covering much of the known world. Egypt, Scythia, Persia, and Asia Minor are all described, including a mention of India. The description of Africa as a whole are contentious, with Herodotus describing the land surrounded by a sea. Though, historically the Indian sea was thought of an inland sea which was that round of the southern part of Africa is surrounded by the eastern part of Asia by connecting land, which inference only after the circumnavigation of Africa by Vasco da Gama was abandoned by the western cartographers of the 15th century. Some, though, hold that the descriptions of areas such as India are mostly imaginary. Regardless, Herodotus made important observations about geography. He is the first to have noted the process by which large rivers, such as the Nile, build up deltas, and is also the first recorded as observing that winds tend to blow from colder regions to warmer ones. Pythagoras was perhaps the first to propose a spherical world, arguing that the sphere was the most perfect form. This idea was embraced by Plato and Aristotle presented empirical evidence to verify this. He noted that the Earth's shadow during an eclipse is curved, and also that stars increase in height as one moves north. Eudoxus of Cnidus used the idea of a sphere to explain how the sun created differing climatic zones based on latitude. This led the Greeks to believe in a division of the world into five regions. At each of the poles was an uncharitably cold region. While extrapolating from the heat of the Sahara it was deduced that the area around the equator was unbearably hot. Between these extreme regions both the northern and southern hemispheres had a temperate belt suitable for human habitation. These theories clashed with the evidence of explorers, however. Hanno the Navigator had traveled as far south as Sierra Leone, and it is possible other Phoenicians had circumnavigated Africa. In the 4th century BC the Greek explorer Pytheas traveled through northeast Europe, and circled the British Isles. He found that the region was considerably more habitable than theory expected, but his discoveries were largely dismissed by his contemporaries because of this. Conquerors also carried out exploration, for example, Caesar's invasions of Britain and Germany, expeditions/invasions sent by Augustus to Arabia Felix and Ethiopia (Res Gestae 26), and perhaps the greatest Ancient Greek explorer of all, Alexander the Great, who deliberately set out to learn more about the east through his military expeditions and so took a large number of geographers and writers with his army who recorded their observations as they moved east. The ancient Greeks divided the world into three continents, Europe, Asia, and Libya (Africa). The Hellespont formed the border between Europe and Asia. The border between Asia and Libya was generally considered to be the Nile river, but some geographers, such as Herodotus objected to this. Herodotus argued that there was no difference between the people on the east and west sides of the Nile, and that the Red Sea was a better border. The relatively narrow habitable band was considered to run from the Atlantic Ocean in the west to an unknown sea somewhere east of India in the east. The southern portion of Africa was unknown, as was the northern portion of Europe and Asia, so it was believed that they were circled by a sea. These areas were generally considered uninhabitable. The size of the Earth was an important question to the Ancient Greeks. Eratosthenes attempted to calculate its circumference by measuring the angle of the sun at two different locations. While his numbers were problematic, most of the errors cancelled themselves out and he got quite an accurate figure. Since the distance from the Atlantic to India was roughly known, this raised the important question of what was in the vast region east of Asia and to the west of Europe. Crates of Mallus proposed that there were in fact four inhabitable land masses, two in each hemisphere. In Rome a large globe was created depicting this world. That some of the figures Eratosthenes had used in his calculation were considerably in error became known, and Posidonius set out to get a more accurate measurement. This number actually was considerably smaller than the real one, but it became accepted that the eastern part of Asia was not a huge distance from Europe. While the works of almost all earlier geographers have been lost, many of them are partially known through quotations found in Strabo (64/63 BC – ca. AD 24). Strabo's seventeen volume work of geography is almost completely extant, and is one of the most important sources of information on classical geography. Strabo accepted the narrow band of habitation theory, and rejected the accounts of Hanno and Pytheas as fables. None of Strabo's maps survive, but his detailed descriptions give a clear picture of the status of geographical knowledge of the time. Pliny the Elder's (AD 23 – 79) Natural History also has sections on geography. A century after Strabo Ptolemy (AD 90 – 168) launched a similar undertaking. By this time the Roman Empire had expanded through much of Europe, and previously unknown areas such as the British Isles had been explored. The Silk Road was also in operation, and for the first time knowledge of the far east began to be known. Ptolemy's Geographia opens with a theoretical discussion about the nature and techniques of geographical inquiry, and then moves to detailed descriptions of much the known world. Ptolemy lists a huge number of cities, tribes, and sites and places them in the world. It is uncertain what Ptolemy's names correspond to in the modern world, and a vast amount of scholarship has gone into trying to link Ptolemaic descriptions to known locations. Land surveyors determined the exact dimensions of a particular area such as a field, dividing the land into plots for distribution, or laying out the streets in a town. Cartographical surveyors made maps, involving finding latitudes, longitudes and elevations. Military surveyors were called upon to determine such information as the width of a river an army would need to cross. Engineering surveyors investigated terrain in order to prepare the way for roads, canals, aqueducts, tunnels and mines. Around AD 400 a scroll map called the Peutinger Table was made of the known world, featuring the Roman road network. Besides the Roman Empire which at that time spanned from Britain to the Middle East and Africa, the map includes India, Sri Lanka and China. Cities are demarcated using hundreds of symbols. It measures 1.12 ft high and 22.15 ft long. The tools and principles of geography used by the Romans would be closely followed with little practical improvement for the next 700 years. No matter where one goes in India, one will find a landscape in which mountains, rivers, forests, and villages are elaborately linked to the stories and gods of Indian culture. Every place in this vast country has its story; and conversely, every story of Hindu myth and legend has its place. The geographers of ancient India put forward theories regarding the origin of the earth. They theorized that the earth was formed by the solidification of gaseous matter and that the earth's crust is composed of hard rocks (sila), clay (bhumih) and sand (asma). Theories were also propounded to explain earthquakes (bhukamp) and it was assumed that earth, air and water combined to cause earthquakes. The Arthashastra, a compendium by Kautilya (also known as Chanakya) contains a range of geographical and statistical information about the various regions of India. The composers of the Puranas divided the known world into seven continents of dwipas, Jambu Dwipa, Krauncha Dwipa, Kusha Dwipa, Plaksha Dwipa, Pushkara Dwipa, Shaka Dwipa and Shalmali Dwipa. Descriptions were provided for the climate and geography of each of the dwipas. The Vishnudharmottara Purana (compiled between 300-350 AD) contains six chapters on physical and human geography. The locational attributes of peoples and places, and various seasons are the topics of these chapters. Varahamihira's Brihat-Samhita gave a thorough treatment of planetary movements, rainfall, clouds and the formation of water. The mathematician-astronomer Aryabhata gave a precise estimate of the earth's circumference in his treatise Āryabhaṭīya. Aryabhata accurately calculated the Earth's circumference as 24,835 miles, which was only 0.2% smaller than the actual value of 24,902 miles. The Mughal chronicles Tuzuk-i-Jehangiri, Ain-i-Akbari and Dastur-ul-aml contain detailed geographical narratives. These were based on the earlier geographical works of India and the advances made by medieval Muslim geographers, particularly the work of Alberuni. An early Western Han Dynasty (202 BC – 9 AD) silk map found in tomb 3 of Mawangdui, depicting the Kingdom of Changsha and Kingdom of Nanyue in southern China (note: the south direction is oriented at the top, north at the bottom). The Yu Ji Tu, or Map of the Tracks of Yu Gong, carved into stone in 1137, located in the Stele Forest of Xian. This 3 feet (0.91 m) squared map features a graduated scale of 100 li for each rectangular grid. China's coastline and river systems are clearly defined and precisely pinpointed on the map. "Yu" refers to Yu the Great, a Chinese deity and the author of the Yu Gong, the geographic chapter of the Book of Documents, dating to the 5th century BC from whence this map is derived. In China, the earliest known geographical Chinese writing dates back to the 5th century BC, during the beginning of the Warring States period (481 BC – 221 BC). This work was the Yu Gong ('Tribute of Yu') chapter of the Shu Jing or Book of Documents, which describes the traditional nine provinces of ancient China, their kinds of soil, their characteristic products and economic goods, their tributary goods, their trades and vocations, their state revenues and agricultural systems, and the various rivers and lakes listed and placed accordingly. The nine provinces at the time of this geographical work were relatively small in size compared to those of modern China with the book's descriptions pertaining to areas of the Yellow River, the lower valleys of the Yangtze and the plain between them as well as the Shandong peninsula and to the west the most northern parts of the Wei and Han Rivers along with the southern parts of modern-day Shanxi province. In this ancient geographical treatise, which would greatly influence later Chinese geographers and cartographers, the Chinese used the mythological figure of Yu the Great to describe the known earth (of the Chinese). Apart from the appearance of Yu, however, the work was devoid of magic, fantasy, Chinese folklore, or legend. Although the Chinese geographical writing in the time of Herodotus and Strabo were of lesser quality and contained less systematic approach, this would change from the 3rd century onwards, as Chinese methods of documenting geography became more complex than those found in Europe, a state of affairs that would persist until the 13th century. The earliest extant maps found in archeological sites of China date to the 4th century BC and were made in the ancient State of Qin. The earliest known reference to the application of a geometric grid and mathematically graduated scale to a map was contained in the writings of the cartographer Pei Xiu (224–271). From the 1st century AD onwards, official Chinese historical texts contained a geographical section, which was often an enormous compilation of changes in place-names and local administrative divisions controlled by the ruling dynasty, descriptions of mountain ranges, river systems, taxable products, etc. The ancient Chinese historian Ban Gu (32–92) most likely started the trend of the gazeteer in China, which became prominent in the Southern and Northern Dynasties period and Sui Dynasty. Local gazeteers would feature a wealth of geographic information, although its cartographic aspects were not as highly professional as the maps created by professional cartographers. From the time of the 5th century BC Shu Jing forward, Chinese geographical writing provided more concrete information and less legendary element. This example can be seen in the 4th chapter of the Huainanzi (Book of the Master of Huainan), compiled under the editorship of Prince Liu An in 139 BC during the Han Dynasty (202 BC – 202 AD). The chapter gave general descriptions of topography in a systematic fashion, given visual aids by the use of maps (di tu) due to the efforts of Liu An and his associate Zuo Wu. In Chang Chu's Hua Yang Guo Chi (Historical Geography of Szechuan) of 347, not only rivers, trade routes, and various tribes were described, but it also wrote of a 'Ba Jun Tu Jing' ('Map of Szechuan'), which had been made much earlier in 150. The Shui Jing (Waterways Classic) was written anonymously in the 3rd century during the Three Kingdoms era (attributed often to Guo Pu), and gave a description of some 137 rivers found throughout China. In the 6th century, the book was expanded to forty times its original size by the geographers Li Daoyuan, given the new title of Shui Jing Zhu (The Waterways Classic Commented). In later periods of the mineral beds such as mica schists. Xu's work was largely systematic, providing accurate details of measurement, and his work (translated later by Ding Wenjiang) read more like a 20th-century field surveyor than an early 17th-century scholar. The Chinese were also concerned with documenting geographical information of foreign regions far outside of China. Although Chinese had been writing of civilizations of the Middle East, India, and Central Asia since the traveler Zhang Qian (2nd century BC), later Chinese would provide more concrete and valid information on the topography and geographical aspects of foreign regions. The Tang Dynasty (618–907) Chinese diplomat Wang Xuance traveled to Magadha (modern northeastern India) during the 7th century. Afterwards he wrote the book Zhang Tian-zhu Guo Tu (Illustrated Accounts of Central India), which included a wealth of geographical information. Chinese geographers such as Jia Dan (730–805) wrote accurate descriptions of places far abroad. In his work written between 785 and 805, he described the sea route going into the mouth of the Persian Gulf, and that the medieval Iranians (whom he called the people of the Luo-He-Yi country, i.e. Persia) had erected 'ornamental pillars' in the sea that acted as lighthouse beacons for ships that might go astray. Confirming Jia's reports about lighthouses in the Persian Gulf, Arabic writers a century after Jia wrote of the same structures, writers such as al-Mas'udi and al-Muqaddasi. The later Song Dynasty ambassador Xu Jing wrote his accounts of voyage and travel throughout Korea in his work of 1124, the Xuan-He Feng Shi Gao Li Tu Jing (Illustrated Record of an Embassy to Korea in the Xuan-He Reign Period). The geography of medieval Cambodia (the Khmer Empire) was documented in the book Zhen-La Feng Tu Ji of 1297, written by Zhou Daguan. After the fall of the western Roman Empire, the Eastern Roman Empire, ruled from Constantinople and known as the Byzantine Empire, continued to thrive and produced several noteworthy geographers. Stephanus of Byzantium (6th century) was a grammarian at Constantinople and authored the important geographical dictionary Ethnica. This work is of enormous value, providing well-referenced geographical and other information about ancient Greece. The geographer Hierocles (6th century) authored the Synecdemus (prior to AD 535) in which he provides a table of administrative divisions of the Byzantine Empire and lists the cities in each. The Synecdemus and the Ethnica were the principal sources of Constantine VII's work on the Themes or divisions of Byzantium, and are the primary sources we have today on political geography of the sixth century East. George of Cyprus is known for his Descriptio orbis Romani (Description of the Roman world), written in the decade 600–610. Beginning with Italy and progressing counterclockwise including Byzantine or Eastern Roman Empire. Cosmas Indicopleustes, (6th century) also known as "Cosmas the Monk," was an Alexandrian merchant. By the records of his travels, he seems to have visited India, Sri Lanka, the Kingdom of Axum in modern Ethiopia, and Eritrea. 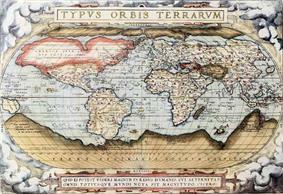 Included in his work Christian Topography were some of the earliest world maps. Though Cosmas believed the earth to be flat, most Christian geographers of his time disagreed with him. Syrian bishop Jacob of Edessa (633–708) adapted scientific material sourced from Aristotle, Theophrastus, Ptolemy and Basil to develop a carefully structured picture of the cosmos. He corrects his sources and writes more scientifically, whereas Basil’s Hexaemeron is theological in style. In the latter 7th century, adherents of the new religion of Islam surged northward out of Arabia taking over lands in which Jews, Byzantine Christians and Persian Zoroastrians had been established for centuries. There, carefully preserved in the monasteries and libraries, they discovered the Greek classics which included great works of geography such as Ptolemy's Almagest and Geography, along with the geographical wisdom of the Chinese and the great accomplishments of the Roman Empire. The Arabs, who spoke only Arabic, employed Christians and Jews to translate these and many other manuscripts into Arabic. The primary geographical scholarship of this era occurred in Persia, today’s Iran, in the great learning center the House of Wisdom at Baghdad, today's Iraq. Early caliphs did not follow orthodoxy and so they encouraged scholarship. Under their rule, native non-Arabs served as mawali or dhimmi, and most geographers in this period were Syrian (Byzantine) or Persian, i.e. of either Zoroastrian or Christian background. Jābir ibn Hayyān (Geber or Jabir) (721– c. 815) Wrote extensively on many subjects, expanded on the wisdom of the Greek classics and engaged in experimentation in natural science. It is unclear whether he was Persian or Syrian. Al-Khwārizmī (780–850) wrote The Image of the Earth (Kitab surat al-ard), in which he used the Geography (Ptolemy) of Ptolemy but improved upon his values for the Mediterranean Sea, Asia, and Africa. Ibn Khurdadhbih (820–912) authored a book of administrative geography Book of the Routes and Provinces (Kitab al-masalik wa’l-mamalik), which is the earliest surviving Arabic work of its kind. He made the first quadratic scheme map of four sectors. Sohrab or Sorkhab (died 930) wrote Marvels of the Seven Climes to the End of Habitation describing and illustrating a rectangular grid of latitude and longitude to produce a world map. Al-Balkhi (850–934) founded the "Balkhī school" of terrestrial mapping in Baghdad. Al-Biruni (973–1052) described polar equi-azimuthal equidistant projection of the celestial sphere. Abu Nasr Mansur (960–1036) known for his work with the spherical sine law. Wrote Book of Azimuths which is no longer extant. Avicenna (980–1037) wrote on earth sciences in his Book of Healing. Ibn al-Faqih (10th century) wrote Concise Book of Lands (Mukhtasar Kitab al-Buldan). Ibn Rustah (10th century) wrote a geographical compendium known as Book of Precious Records. In the early 10th century, Abū Zayd al-Balkhī, a Persian originally from Balkh, founded the "Balkhī school" of terrestrial mapping in Baghdad. The geographers of this school also wrote extensively of the peoples, products, and customs of areas in the Muslim world, with little interest in the non-Muslim realms. Suhrāb, a late 10th-century Persian geographer, accompanied a book of geographical coordinates with instructions for making a rectangular world map, with equirectangular projection or cylindrical equidistant projection. In the early 11th century, Avicenna hypothesized on the geological causes of mountains in The Book of Healing (1027). 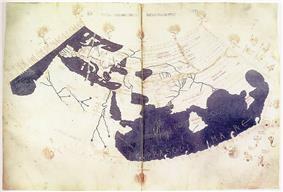 The Tabula Rogeriana, drawn by Al-Idrisi for Roger II of Sicily in 1154. Note that in the original map, the north is at the bottom and south at the top, in contrast to modern cartographic conventions. In mathematical geography, Persian Abū Rayhān al-Bīrūnī, around 1025, was the first to describe a polar equi-azimuthal equidistant projection of the celestial sphere. He was also regarded as the most skilled when it came to mapping cities and measuring the distances between them, which he did for many cities in the Middle East and western Indian subcontinent. He combined astronomical readings and mathematical equations to record degrees of latitude and longitude and to measure the heights of mountains and depths of valleys, recorded in The Chronology of the Ancient Nations. He discussed human geography and the planetary habitability of the Earth, suggesting that roughly a quarter of the Earth's surface is habitable by humans. He solved a complex geodesic equation in order to accurately compute the Earth's circumference. His estimate of 6,339.9 km for the Earth radius was only 16.8 km less than the modern value of 6,356.7 km. By the early 12th century the Normans had overthrown the Arabs in Sicily. Palermo had become a crossroads for travelers and traders from many nations and the Norman King Roger II, having great interest in geography, commissioned the creation of a book and map that would compile all this wealth of geographical information. Researchers were sent out and the collection of data took 15 years. Al-Idrisi, one of few Arabs who had ever been to France and England as well as Spain, Central Asia and Constantinople, was employed to create the book from this mass of data. Utilizing the information inherited from the classical geographers, he created one of the most accurate maps of the world to date, the Tabula Rogeriana (1154). The map, written in Arabic, shows the Eurasian continent in its entirety and the northern part of Africa. An adherent of environmental determinism was the medieval Afro-Arab writer al-Jahiz (776–869), who explained how the environment can determine the physical characteristics of the inhabitants of a certain community. He used his early theory of evolution to explain the origins of different human skin colors, particularly black skin, which he believed to be the result of the environment. He cited a stony region of black basalt in the northern Najd as evidence for his theory. During the Early Middle Ages, geographical knowledge in Europe regressed (though it is a popular misconception that they thought the world was flat), and the simple T and O map became the standard depiction of the world. During the 15th century, Henry the Navigator of Portugal supported explorations of the African coast and became a leader in the promotion of geographic studies. 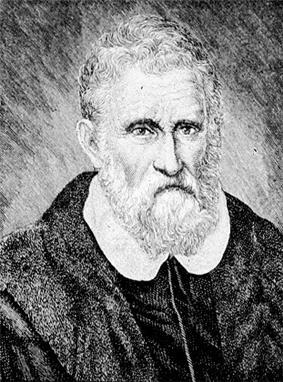 Among the most notable accounts of voyages and discoveries published during the 16th century were those by Giambattista Ramusio in Venice, by Richard Hakluyt in England, and by Theodore de Bry in what is now Belgium. 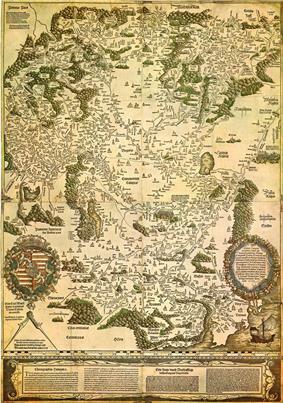 Tabula Hungariae, Ingolstadt, 1528 - the earliest surviving printed map of the Kingdom of Hungary. Universalis Cosmographia, the Waldseemüller wall map dated 1507, depicts the Americas, Africa, Europe, Asia, and the Pacific Ocean separating Asia from the Americas. 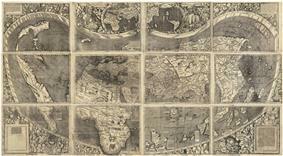 Following the journeys of Marco Polo, interest in geography spread throughout Europe. From around c. 1400, the writings of Ptolemy and his successors provided a systematic framework to tie together and portray geographical information. The European global exploration started in the early 15th century with the first Portuguese expeditions to Africa and India, as well as the Discovery of America by Spain in 1492 and continued with a series of European naval expeditions across the Atlantic and later the Pacific and Russian expeditions to Siberia until the 18th century. European overseas expansion led to the rise of colonial empires, with the contact between the Old and New Worlds producing the Columbian Exchange: a wide transfer of plants, animals, foods, human populations (including slaves), communicable diseases and culture between the continents. These great voyages of exploration in 16th and 17th centuries revived a desire for both accurate geographic detail, and more solid theoretical foundations. The Geographia Generalis by Bernhardus Varenius and Gerardus Mercator's world map are prime examples of the new breed of scientific geography. The Waldseemüller map Universalis Cosmographia, created by German cartographer Martin Waldseemüller in April 1507, is the first map of the Americas in which the name "America" is mentioned. It was patterned after a modification of Ptolemy's second projection but expanded to include the Americas. The Waldseemuller Map has been called "America's birth certificate" Waldseemüller also created printed maps called globe gores, that could be cut out and glued to spheres resulting in a globe. Besides those mentioned here, there were many other geographers of the Medieval and Early Modern eras. By the 18th century, geography had become recognized as a discrete discipline and became part of a typical university curriculum in Europe (especially Paris and Berlin), although not in the United Kingdom where geography was generally taught as a sub-discipline of other subjects. 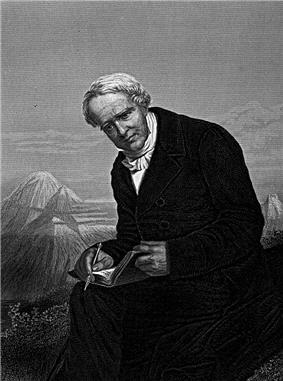 One of the great works of this time was Kosmos: a sketch of a physical description of the Universe, by Alexander von Humboldt, the first volume of which was published in German in 1845. Such was the power of this work that Dr Mary Somerville, of Cambridge University intended to scrap publication of her own Physical Geography on reading Kosmos. Von Humboldt himself persuaded her to publish (after the publisher sent him a copy). In 1877, Thomas Henry Huxley published his Physiography with the philosophy of universality presented as an integrated approach in the study of the natural environment. The philosophy of universality in geography was not a new one but can be seen as evolving from the works of Alexander von Humboldt and Immanuel Kant. The publication of Huxley physiography presented a new form of geography that analysed and classified cause and effect at the micro-level and then applied these to the macro-scale (due to the view that the micro was part of the macro and thus an understanding of all the micro-scales was need to understand the macro level). This approach emphasized the empirical collection of data over the theoretical. The same approach was also used by Halford John Mackinder in 1887. However, the integration of the Geosphere, Atmosphere and Biosphere under physiography was soon over taken by Davisian geomorphology. Over the past two centuries the quantity of knowledge and the number of tools has exploded. There are strong links between geography and the sciences of geology and botany, as well as economics, sociology and demographics. The National Geographic Society was founded in the USA in 1888 and began publication of the National Geographic magazine which became and continues to be a great popularizer of geographic information. The society has long supported geographic research and education. In the West during the second half of the 19th and the 20th century, the discipline of geography went through four major phases: environmental determinism, regional geography, the quantitative revolution, and critical geography. Environmental determinism is the theory that a people's physical, mental and moral habits are directly due to the influence of their natural environment. Prominent environmental determinists included Carl Ritter, Ellen Churchill Semple, and Ellsworth Huntington. Popular hypotheses included "heat makes inhabitants of the tropics lazy" and "frequent changes in barometric pressure make inhabitants of temperate latitudes more intellectually agile." Environmental determinist geographers attempted to make the study of such influences scientific. Around the 1930s, this school of thought was widely repudiated as lacking any basis and being prone to (often bigoted) generalizations. Environmental determinism remains an embarrassment to many contemporary geographers, and leads to skepticism among many of them of claims of environmental influence on culture (such as the theories of Jared Diamond). Regional geography was coined by a group of geographers known as possibilists and represented a reaffirmation that the proper topic of geography was study of places (regions). Regional geographers focused on the collection of descriptive information about places, as well as the proper methods for dividing the earth up into regions. Well-known names from these period are Alfred Hettner in Germany and Paul Vidal de la Blache in France. The philosophical basis of this field in United States was laid out by Richard Hartshorne, who defined geography as a study of areal differentiation, which later led to criticism of this approach as overly descriptive and unscientific. However, the concept of a Regional geography model focused on Area Studies has remained incredibly popular amongst students of geography, while less so amongst scholars who are proponents of Critical Geography and reject a Regional geography paradigm. It can be argued that Regional Geography, which during its heyday in the 1970s through early 1990s made substantive contributions to students' and readers' understanding of foreign cultures and the real world effects of the delineation of borders, is due for a revival in academia as well as in popular nonfiction. The quantitative revolution in geography began in the 1950s. Geographers formulated geographical theories and subjected the theories to empirical tests, usually using statistical methods (especially hypothesis testing). This quantitative revolution laid the groundwork for the development of geographic information systems. Well-known geographers from this period are Fred K. Schaefer, Waldo Tobler, William Garrison, Peter Haggett, Richard J. Chorley, William Bunge, and Torsten Hägerstrand. Though positivist approaches remain important in geography, critical geography arose as a critique of positivism. The first strain of critical geography to emerge was humanistic geography. Drawing on the philosophies of existentialism and phenomenology, humanistic geographers (such as Yi-Fu Tuan) focused on people's sense of, and relationship with, places. More influential was Marxist geography, which applied the social theories of Karl Marx and his followers to geographic phenomena. David Harvey and Richard Peet are well-known Marxist geographers. Feminist geography is, as the name suggests, the use of ideas from feminism in geographic contexts. The most recent strain of critical geography is postmodernist geography, which employs the ideas of postmodernist and poststructuralist theorists to explore the social construction of spatial relations. ^ a b Kurt A. Raaflaub & Richard J. A. Talbert (2009). Geography and Ethnography: Perceptions of the World in Pre-Modern Societies. ^ The Ancient History of Herodotus By Herodotus. p200. (cf., Asia is well inhabited; but from India eastward the whole country is one vast desert, unknown and unexplored). ^ Lewis, Michael J. T. Lewis Surveying Instruments of Greece and Rome Cambridge University Press, Cambridge, UK, 2001, p. 3. ^ a b c d e Anu Kapur (2002). Indian Geography: Voice of Concern. Concept Publishing Company. ^ Diana L. Eck (2012). India: A Sacred Geography. Random House Digital, Inc.
^ a b c d Lalita Rana (2008). Geographical thought. Concept Publishing Company. ^ a b c Needham, Volume 3, 500. ^ Needham, Volume 3, 501. ^ Needham, Volume 3, 512. ^ Needham, Volume 3, 508. ^ a b Hsu, 98. ^ Needham, Volume 3, 507–508. ^ Needham, Volume 3, 517. ^ a b Needham, Volume 3, 514. ^ a b Needham, Volume 3, 510. ^ a b c d Needham, Volume 3, 511. ^ a b Needham, Volume 3, 524. ^ Needham, Volume 4, Part 3, 661. ^ Yule, Henry. Cathay and the Way Thither. Asian Educational Services. pp. 212–32. ^ Miller, Hugh (1857). The Testimony of the Rocks. Boston: Gould and Lincoln. p. 428. ^ S.N. Nasr, "Life Sciences, Alchemy and Medicine", The Cambridge History of Iran, Cambridge, Volume 4, 1975, p. 412: "Jabir is entitled in the traditional sources as al-Azdi, al-Kufi, al-Tusi, al-Sufi. There is a debate as to whether he was a Persian from Khorasan who later went to Kufa or whether he was, as some have suggested, of Syrian origin and later lived in Iran". ^ Cartography in Antiquity and the Middle Ages: Fresh Perspectives, New Methods p. 129. ^ Brentjes, S. “International Encyclopedia of Human Geography: Cartography in Islamic Societies” Universidad de Sevilla, Sevilla, Spain, 2009, p. 421. ^ David A. King (1996), "Astronomy and Islamic society: Qibla, gnomics and timekeeping", in Roshdi Rashed, ed., Encyclopedia of the History of Arabic Science, Vol. 1, pp. 128–184 . Routledge, London and New York. ^ Lawrence I. Conrad (1982), "Taun and Waba: Conceptions of Plague and Pestilence in Early Islam", Journal of the Economic and Social History of the Orient 25 (3), pp. 268–307 . ^ Snyder, John P. (1993). Flattening the Earth: 2000 Years of Map Projections, p. 33. Chicago: The University of Chicago Press. ^ Hebert, John R. The Map That Named America Library of Congress Information Bulletin, September 2003, Accessed August 2013. Allen, Nellie Burnham (1916). Geographical and industrial studies; Asia. Ginn and company. Retrieved 24 April 2014. Smith, Joseph Russell (1921). Peoples and countries. Volume 1 of Human Geography. John C. Winston Company. Retrieved 24 April 2014.
at Google Book SearchThe Story of Maps, a history of cartography; why North is at the "top" of a map, how they surveyed all of Europe and other interesting facts.